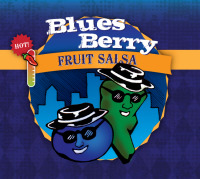 The subtle sweetness of Pacific Northwest Blueberries combined with a blend of onions and peppers produces a very distinctive 100% fruit salsa. It can be used for a wide variety of things. It can be eaten from the jar, used as a marinade, a pizza sauce, a salad dressing and many other uses.